The wall chart below is an update from an earlier chart – A Quick Trip to 7 Billion – which marked the addition of Earth’s 7 billionth member. But there have been some significant changes since this milestone in 2011, and the new chart has not only updated statistics but focuses on the pressing issues of today. On one side of the wall chart you’ll find a timeline of historical events, inventions and social movements that have affected birth and death rates over the past 200 years, bringing us to 7.6 billion humans in 2018. The other side of the wall chart uses a variety of colorful infographics to show the challenges we face as a growing global family – from meeting basic human needs to the delicate balance of natural ecosystems. Rollover the poster for a detailed view. Scroll down for accompanying lesson plans and purchasing information. The lesson plans below will engage your students with in-depth investigations of the wall chart, further research on interrelated global topics, and fun analysis of the content. **Share this high-resolution version of the poster with students to ensure viewing ease. 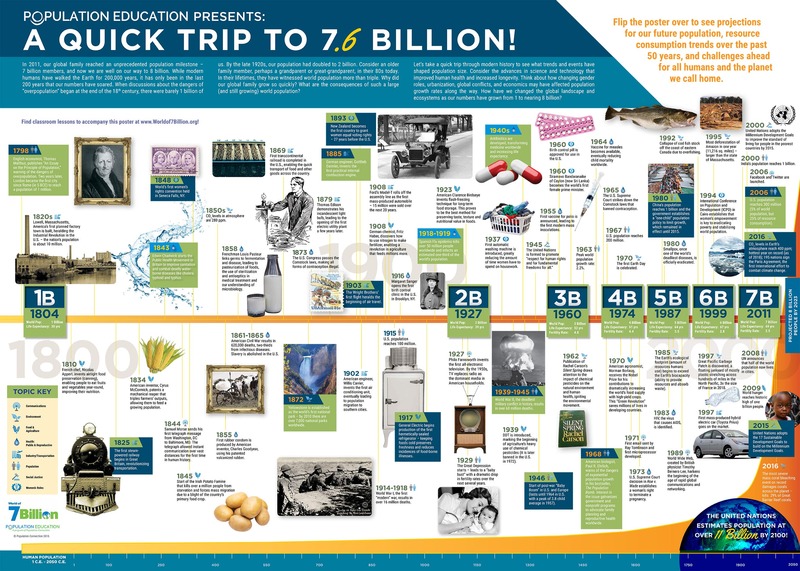 Exploring the Timeline – Students analyze the timeline on the A Quick Trip to 7.6 Billion poster to answer questions and complete a graphic organizer, exploring how past events have contributed to our current population size and resource use. 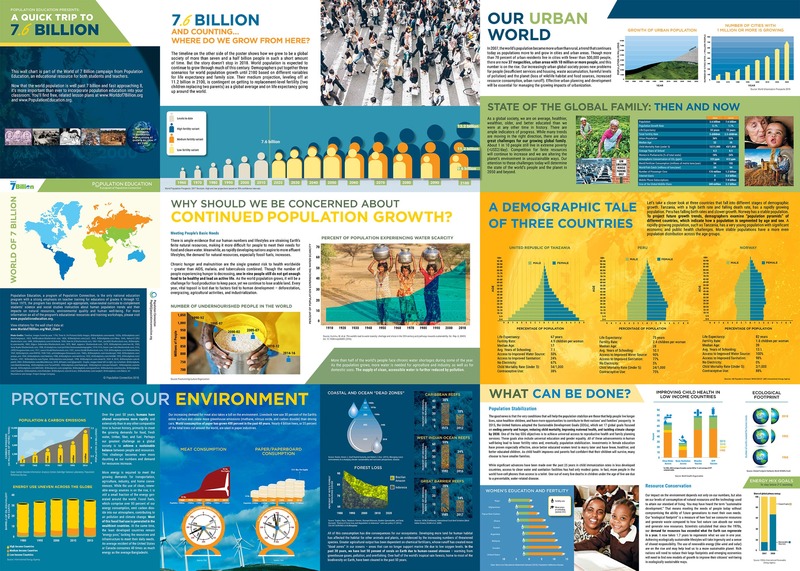 Infographic Scavenger Hunt – Through collaborative analysis of visual data (infographics) found on the A Quick Trip to 7.6 Billion poster, students investigate today’s demographics and resource use and how we can reduce future environmental impacts. 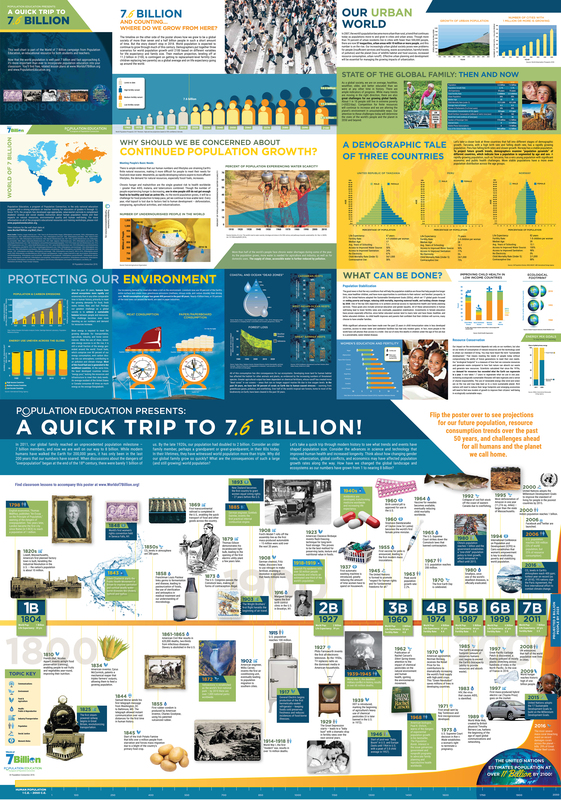 Report Card for the Planet – Using the A Quick Trip to 7.6 Billion poster, students complete a “report card” to determine whether progress has been made in key indicators of human well-being and environmental health over the past 200 years, and then evaluate what these changes mean. Want the poster for your classroom? Purchase one for $4, or buy multiples for just $3/each. Buy it now!